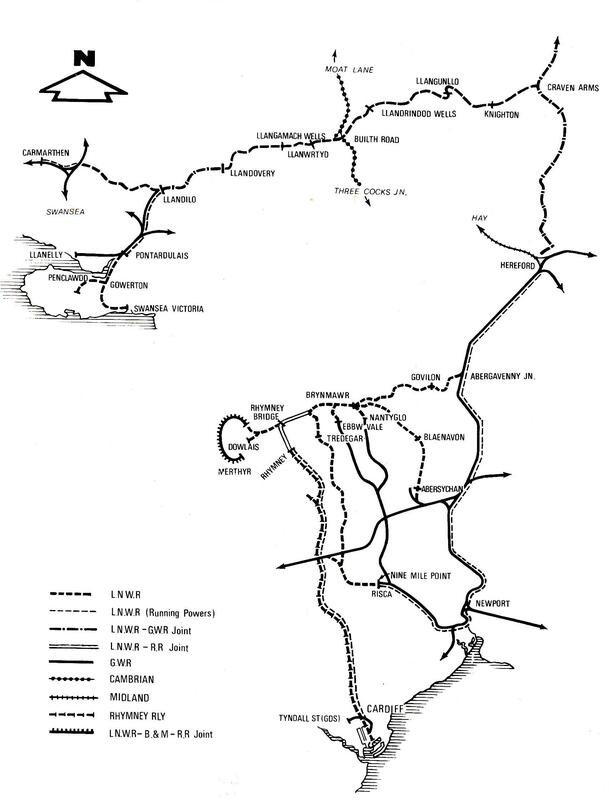 The LNWR in South and Central Wales for the LNWR in North Wales. Following the Railways Act 1921 the London & North Western Railway became a constituent part of the London Midland & Scottish Railway on 1st January 1922. For the London & North Western Railway. For the Brecon & Merthyr & LNWR Joint. Six Railways to Merthyr. Hodge, John, WRRC, 2014. ISBN 978-09527267-7-7. Abergavenny to Merthyr including Ebbw Vale Branch. Edge, David, Middleton Press, 2002. ISBN 0853613133. The Merthyr, Tredegar & Abergavenny Railway and branches Tasker, W. W., Oxford Oublishing Co, 1986. ISBN 0860933393. The Merthyr, Tredegar & Abergavenny Railway Chris Barber, Amberley, 2017. ISBN 9781445663289. Memoirs of the Sirhowy Branch 1868 - 1960 Tasker, W. W., Treowen Press; ISBN 0952480301. The Origins of the LMS In South Wales Gwyn Briwnant Jones & Denis Dunstone, Gomer, 1999. ISBN 0-906899-66-4. The London and North Western Railway M. C. Reed, Atlantic, 1996. ISBN 0952480301. LNWR Working Time Tables: Shropshire District, Shrewsbury & Hereford Line, and Central Wales & Swansea District 1908. Dragonwheel Books, 2005. ISBN 1 905014 27 9. LNWR Working Time Tables: South Wales Division, The Merthyr, Tredegar & Abergavenny Line and Branches 1908. Dragonwheel Books, 2005. ISBN 1 905014 09 0. London Midland & Scottish Railway Locomotive Allocations The Last Day 1947 John Hooper, Irwell Press, 1989. ISBN 1 87 1608 02 3. LMS Engine Sheds Vol.1 The LNWR C.Hawkins & G.Reeve , Wild Swan Publications, 1981. ISBN 0 906867 02 9. A Railway Moon a Man and his Railway; Sir Richard Moon and the LNWR Peter Braine, PMB Publishing, 2010. ISBN 978-0-9565290-0-8. Railways in the Sirhowy Valley (2nd edition). Tasker, W. W., Oakwood Press, Headington, 1982; ISBN 0853614156. Shrewsbury To Swansea. DJ Smith, Town and Country Press, 1971. Portrait Of The Central Wales Line. Martin Smith, Ian Allen, 1995, ISBN 9780711023468. Railway Magazine, March 1907. Cardiff: The City, Its Railways and Commerce. Railway Magazine, May and June 1906. The Central Wales Railway.